Promoting your health and our heritage in affordable and sustainable ways. No one has to be worse off for us to be better off. You leave the hectic pace of the motorway at the N6/N80 junction in Tober. We make downtime possible and effective on your terms. To add interest to your visit we ask you to consider our theory that the Shannon and Boyne rivers were linked. The Yellow river, a tributary of the Boyne, is close to the Silver River near Croghan Hill. Could the area have formed a shallow, possibly seasonal, lake in the flood plain of the Brosna and Silver river when Saints such as Saint Brendan were travelling from the schools and scriptoriums at Clonmacnoise and Clonard. We tell you our theory and add your knowledge and experience to the mix. Thinking like this, outside the box, can be therapeutic…and if the theory proves true it could be relevant to our history. Between us we could figure out the match of the day version of the our medieval history. Feel free to email your views if you are unable to meet us this year. 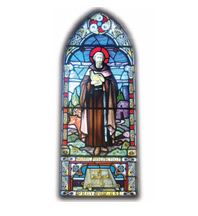 We invite and encourage you to ask and/or answer questions which could prove or disprove the theory that monks (and everyone else) could travel on shallow lakes in the midlands (and beyond) in the lifetime of Saints such as Patrick, Brendan, Barron, Columcille, Colman and Manchan and for hundreds of years before and after their lives. To make the point, let us consider the possibility that there was 30cm more water (just one foot) and 10cm less raised bog in the year 700AD. The water “shoreline” would be near the 200 foot or 61 metres contour line. We will leave it to the experts to explain the science behind it. Just one foot of water is enough to allow easy movement between Clonmacnoise and Clonard and around the ancient territory of Fir Ceall. 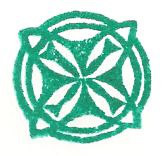 The lost symbol of Tihilly was found in a ploughed field near Clara and reported in the Journal of the Royal Society of Antiquaries of Ireland in the 1800's. It is again lost. When you join our tour you become the player and the piece in a game to find this and other unburied treasure that could otherwise be lost forever. We are also looking for place names, hidden gems and forgotten people so we report them to the local history groups. Nativeguide struck “gold”...since its inception in 2007... and during a recession. Nativeguide is a hobby/business using spare time, spare capacity, cognitive surplus and our rich history to develop and protect a resource for future generations. It turns out this area, the territory of Fir Cheall, was rockin’ during the Golden Age, circa 700AD. Tober, County Offaly and Moate, County Westmeath are not noted for their history yet we have so much to be proud of. The Department of Environment and the National Roads Authority have done the hard work and reported it on archaelogy.ie and nra.ie. 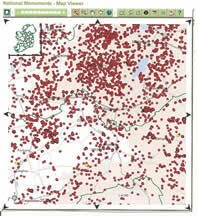 Each red dot on the archaeology website (pictured above) represents a site worth reporting. Earlier still people in Tober lived in this Bronze Age settlement found by the National Roads Authority. Click here to view Reconstruction of Tober House. We grow our own experts in this parish. Did you know Patrick Geoghegan (History every Sunday on Radio Newstalk 106-108fm 7-9pm) is one of ours. We are also proud to claim John Sheehan UCC. Some farmers consider the badger and the archaeologist a threat to their livelihood. Nativeguide supports the archaeologist (and all other ologists) as they are the treasure hunters who will preserve the (golden age) nuggets that have sustained countless generations. We will learn our history, be proud of it and able to tell it on. Our local history is monastic but we make no judgement on your religion. Your religion is between you and your god(s). We will just stick to the facts. Some say heaven, whatever you perceive it to be, can be found by backing away from hell, whatever you perceive that to be. This mushroom stone refused to budge when a glacier scraped by during the ice age. It was wave-worn by (two?) ancient lakes and may have had other uses since? Nativeguide (with help from Kevin and Davy) reported it to John Feehan in 2009 so that its place in history is officially recorded. We may have found some lost sites too. See Offaly History Journal 2010 or offalyhistory.com. Others have already found and reported Ballinderry Crannog, a significant Viking Settlement. A high status pagan burial was also found nearby. Nativeguide will continue to treat this area as if it is a trench under investigation. Caimin O Brian (the duracell bunny of Archaeologists!) is collecting the names of field names and tracking their location by GPS. Amanda Pedlow (the duracell bunny of Heritage Officers!) is collecting the data and training volunteers how to use the tracking devices. Feel free to use Nativeguide to get a message to them if you have anything to report. Are you an “unused resource”? It seems the Romans didn’t settle in Ireland but it wasn’t like them not to have a look. “Pushing the envelope” was their thing! We may never know what they were up to but there is no reason why future generations can’t know the best bits of what we know or could know. Let’s not dwell on what is lost. Let’s gather and preserve what we can find. (No digging, that’s illegal.) There are no limits to the thinking and chatting but please don’t trespass over lands or lives. Feel free to email us if you are unable to travel to Tober. We have a lot to learn from the Offaly and Westmeath Diaspora but we are equally open to ideas from anyone else. “Roaming” army and High Mileage club”? The “roaming army” who are on the road for work (doctors, nurses, vets, salespeople, truckers...) are highly skilled researchers and may be better equipped than the most famous explorer. They are entitled to breaks and can use their cameras, phones and tracking devices to glean information. Some energetic retirement groups refer to themselves as” the high mileage club”. They too are skilled and able explorers. We will provide a free cuppa on the first Friday of every month for the individuals or groups who are game to explore the (700AD) midlands combining their rich experience with local knowledge for the greater good. Email Nativeguide in advance so we can have the kettle on. Consider yourself recruited if this puzzle appeals to you. If it adds to your workload it is not for you. It only works if it entertains and energises you. Enjoy the story and glory of the Golden Age by taking a closer look at their lives. Add your own “cognitive surplus” by mixing childhood experiences and modern day learning to present the information you think should be available to future generations. Enjoy this puzzle. Email your observations and suggestions. Don’t worry about sequence or context as the experts can unravel and report the findings when Nativeguide gathers the “facts”.